This reminds me of the issue of what it means for the LDS apostles to be “special witnesses” of Jesus Christ. Many Mormons are inclined to believe that this means the LDS apostles have, like Paul, received personal, bodily visitations of Jesus Christ. The LDS apostles are quite aware of this common Mormon perception, yet intentionally choose not to correct it. Like so many other things in Mormonism, it is left in the suggestive, convenient “we can neither confirm nor deny” territory of plausibly deniability. Ever since then, the prophet’s auto-pen signature machine has spoken, and Mormons have listened to it as to the very voice of God. The debate is over… or is it? Published July 30, 2009. Accessed April 17, 2012.
thankfully multitudes are finding it . Ah the magic signing machine. How would Mormons explain this? What’s the alibi? Mormon leadership has a way of being able to spin things to keep the dutiful, faithful Mormons on board. I’ve read a lot of Steve Benson’s posts on another site and what he has to say, as a use-to-be insider, is really interesting. The boys at the top were doing all they could to keep his grandfather propped up as he was really debilitated by stroke. 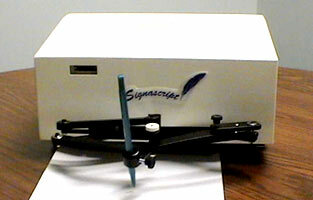 They used anything they could to keep the myth of the prophet rolling along including the use of the magic signing machine. There’s only one thing that’s going to save Mormons and that’s if they come to an understanding of who Jesus is and what He did on the cross. A clear understanding of the nature of God and salvation through faith in Jesus is reached by the intercession of the Holy Spirit. The article above is very important in that it demonstrates exactly what the Mormon cover-up is all about. Losing faith in the Mormon system is one thing, but losing faith in God is quite another. Hopefully Mormons won’t equate God with the false religion of Mormonism.